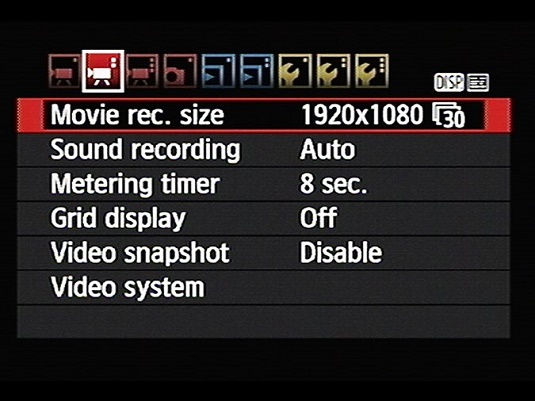 Movie Recording Size: This option determines movie resolution (frame size, in pixels), frames per second (fps), and frame aspect ratio. This setting is a little complex. Options controlling video quality and sound recording reside on Movie Menu 2. Sound Recording: Via this menu item, you adjust microphone volume and a couple other sound options. Metering Timer: By default, exposure information such as f-stop and shutter speed disappears from the display after 8 seconds if you don’t press any camera buttons. If you want the exposure data to remain visible for a longer period, you can adjust the shutdown time through this menu option. Just keep in mind that the metering mechanism uses battery power, so the shorter the cutoff time, the better. Grid Display: You can choose to display one of two different grid styles on the monitor to help ensure alignment of vertical and horizontal structures when you’re framing the scene. Video Snapshot: This feature enables you to shoot multiple brief movie clips and then combine the clips into one movie. Turn off this feature for regular movie recording. Video System: This option sets the camera to one of two video standards, NTSC or PAL. NTSC is the standard in North America and Japan; PAL is used in Europe, China, and many other countries.